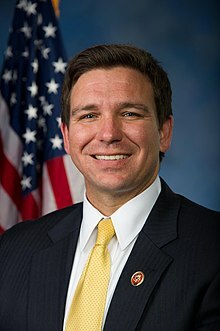 New reports of recent speeches at an annual conference held by a right-wing extremist who has espoused white supremacist and Islamophobic views provide the latest evidence that Florida’s Republican gubernatorial nominee, Rep. Ron DeSantis, has supported racist groups and associated with their viewpoints in the recent past. The congressman, who announced Monday he was resigning from his seat to campaign full time against Democrat Andrew Gillum—the Sen. Bernie Sanders (I-Vt.)-backed, African American mayor of Tallahassee—spoke four times in the last five years at the annual conferences of the David Horowitz Freedom Center. Previous Previous post: The Republican Approach to Voter Fraud: Lie They use the fallacy of rampant cheating at the polls to make it harder for people to vote.